• Dedicated 70 bbl trucks with all of the latest equipment to accurately pump out water from monitoring wells. 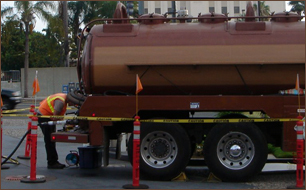 • All trucks come with 80 gallon gauge tanks with a sight tube to monitor gallons every five gallons. • All trucks come with in-line sampling device to allow tech to take samples from water while continuously pumping. • All trucks come with well clamp and 1” PVC stingers to dedicate to wells so there is no cross contamination of fluid between wells.